The atmosphere at Wink Eyecare Boutique is warm and inviting, our people knowledgeable and friendly. 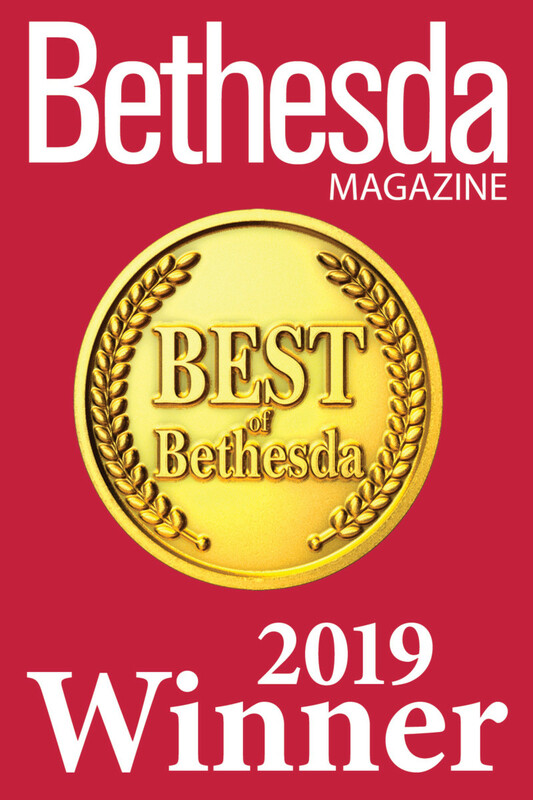 Your Potomac optometrist Dr. Rachel Cohn and her staff have combined advanced technology with current industry trends so you may always look and see your best. Whether you live in Potomac, Rockville, or North Potomac, Dr. Cohn’s practice is conveniently located to assist you and looks forward to servicing your eyecare needs. From thorough eye exams and assessments to helpful explanations and preventive care advice, our focus is on you. We are committed to providing you and your family with the highest-quality, comprehensive vision and eyecare. Five stars for the staff at Wink Eyecare Boutique. They were very professional and courteous to me. Amy was amazing! Amy went out of her way to help me. She could have ignored my problem since I didn’t buy my problem glasses at Wink, but she solved the matter! I certainly would recommend and applaud Wink Eyecare. Thank you Amy!!! The staff is friendly and dependable. From the very first visit they really take care of you. It doesn't matter if you are window shopping, an eye exam, or even dealing wiht a eyeglass issue they will do their best to help you out. Warm, friendly, and highly competent staff! Kim is very helpful and a pleasure to work with. From the state of the art eye examination with Dr. Cohn (no dilation necessary!) to the selection of fashionable frames, we would never venture elsewhere! My husband and I appreciate the friendly staff, helpful and honest assistance in selecting frames and careful exams. We've been customers/patients for years now. We highly recommend Wink! It was my very first eye exam, and everyone there treated me with the utmost respect! They were all very informative, and knew exactly which pair of glasses would look best on me! Cassidy and Dr. Cohn were incredible! I would refer them to anyone who may need an eye exam or a new pair of glasses! Everyone here is so nice and helpful. They have an outstanding selection of frames and help you select the best look for you. WOWED!!!!! Knowledgeable and attentive staff with attention to detail. Found the perfect pair of glasses! Corneal Refractive Therapy (CRT) or orthokeratology is the leading, non-surgical correction for nearsightedness in children & adults. Through overnight contact lenses, achieve clear vision in the day without glasses or contacts. 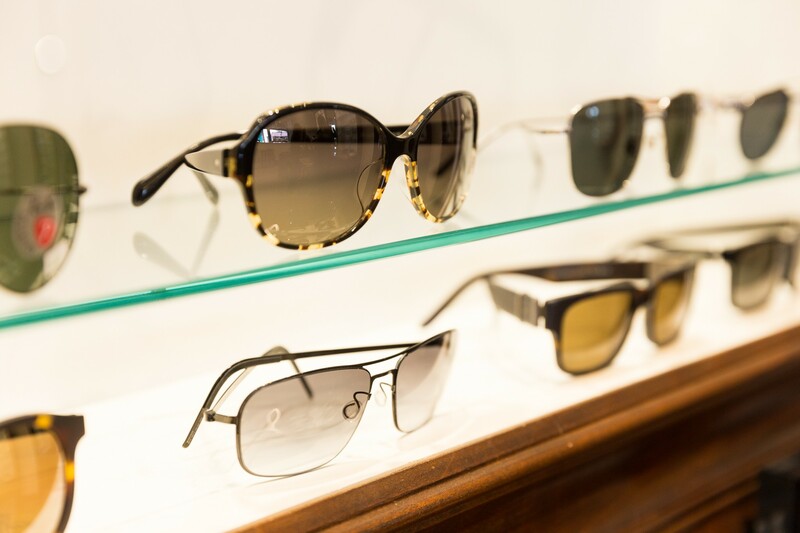 Our certified opticians at Wink Eyecare Boutique present the greatest selections of Robert Marc frames - popular among celebrities, handmade in glamorous colors for Men and Women as well as Oliver Peoples and Anne Valentin. Nearsightedness across America and the world has reached 20-40% of people nationwide and 70-90% for those from East Asia. Stop myopia or nearsightedness & reduce the risk of glaucoma, myopic degeneration, and retinal detachment. Come in. Take a peek. You'll see that we've created a cool, modern boutique that emphasizes style, comfort and superior service. We carry only the best in fashion. Doctor Rachel Cohn graduated with honors from the University of Maryland and the Pennsylvania College of Optometry. She is certified in the treatment and management of ocular conditions using therapeutic pharmaceutical agents. Her warm, personal demeanor makes patients feel like family-which is a reason why so many return year after year. 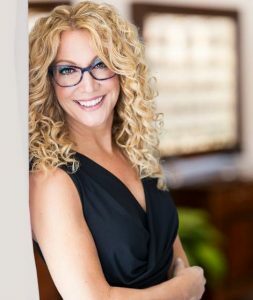 Doctor Cohn’s unending passion for knowledge in her field has opened the door to several special areas of interest, including contact lenses, pediatrics and laser vision correction. Policy Notice: If you fail to cancel your office appointment at least 24 hours ahead, or fail to show up for your scheduled appointment, you will be charged a “No Show Fee/ Cancellation Fee” of $40. 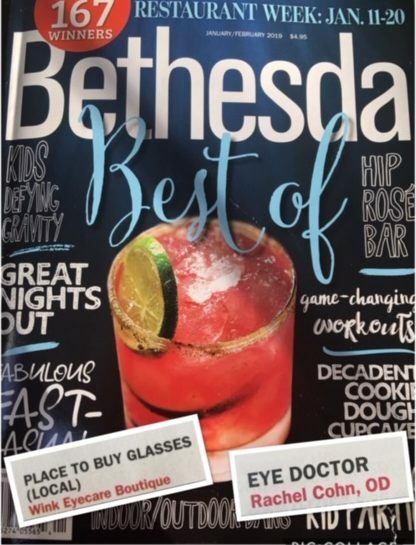 Wink was voted as the best place to get glasses, and Dr. Cohn received the top vote for the best eye doctor. Looking for an eye doctor in Rockville? Visit us! For over a decade, Wink Eyecare Boutique has continuously provided fashionable eyewear and comprehensive eye care in Potomac, MD. Not only has our eye doctor, Dr. Rachel Cohn, helped patients of every age achieve healthy clear vision, but our team continues to bring expertise and unmatched care for anyone looking for an optometrist. For excellent eye care in Potomac, come to Wink! Wink Eyecare Boutique - Located at 1095 Seven Locks Rd, Potomac, MD, 20854. Phone: 301-545-1111. https://www.wink.net.